How does Scrip Work? SSLC participates in Scrip - a nation-wide, year-round, fundraising program for schools and non-profits in which merchants issue gift cards at a discount to SSLC. We then sell cards to you at their face value. You, the shopper, in turn, use the cards in place of cash/check/credit cards to make purchases at the stores. Example: Scrip buys $100 worth of Cub giftcards at a 4% profit, so the $100 card cost Scrip $96. 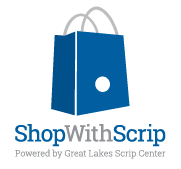 The Scrip program sells that card for face value, $100, and earns $4 rebate. You then use the card to pay for groceries. No extra cost to you - and we earn $4! How does Scrip support St. Stephanus? The proceeds from the 2017-2018 Scrip year (December - June) will support the Youth Mission trip to Puerto Rico. Funds from the program will be split evenly among all participants. Order Form: available on the youth bulletin board at church, or can be printed using this link. The order form highlights Twin Cities vendors we think you'll use often. Order forms can be turned into Megan Huff with a check made out to "St. Stephanus Youth Group." Online: at www.shopwithscrip.com. There you can see a full list of vendors, have the option paying online, and taking advantage of Scrip Now (digital card), and reload features from some of the vendors - meaning no wait to you before you can use the funds. Questions or Suggestions? Check out our FAQ page for additional information. For any other questions or suggestions, please contact our Scrip Coordinator, Megan Huff, at 608-332-8636, or youth@saintstephanus.org.